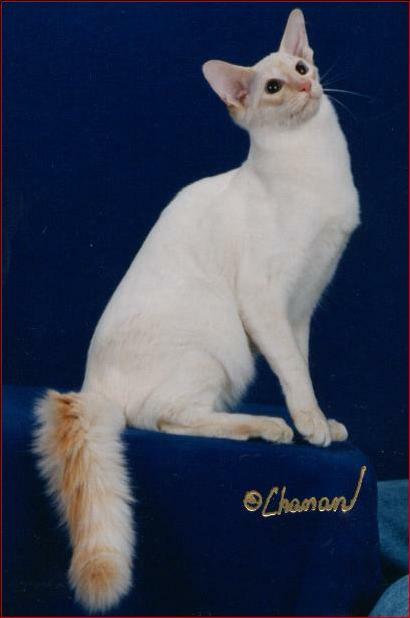 Red’s first breeding was to a Siamese male who was over 10 yrs old. 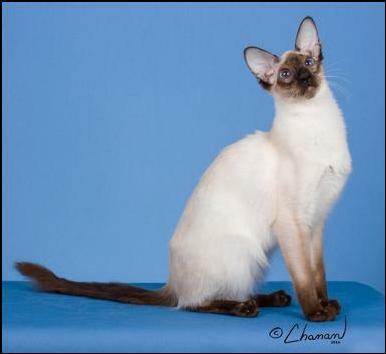 She produced a pretty Shorthaired Blue Pt Balinese female named Clowntown’s Ms Torie Too, D.M., Named after both her mother and father. As per CFA rules she could not be shown. So she is the mother of 2011-2012 CFA’s Best Balinese this year, Come Blow Your Horn. Red Alert the 1st Red Pt. Distinguished Merit Award winner June 2015. Only the 3rd D.M. in history of the Javanese! Red is the Sire of many grand champions. Best Balinese in CFA 2016-2017 Season. Son of CH. BW Clowntown’s Remember You Too, CFA’s Breed Winner 2014-2015. He is the Great Grandson of GC , BW, RW Clowntown’s Come Blow Your Horn, Breed Winner 2012, Great, Great Grandson of Clowntown’s Ms Torie Too DM, Great, Great, Great Grandson to GC BW Clowntown’s Ms. Red Too, Breed Winner 2009, and Great, Great, Great, Great Grandson to Clowntown’s Red Alert DM Breed Winner 2003! CFA has finally started the path into the 21st century, when it comes to “Breeds” or rather different variations of the same breed. Hair length and color are not a breed. Nor are Blacks, Hispanics and Caucasians a different species, but the different variations of the same group. CFA now allows Balinese and Javanese to be together and show divisionally rather than disqualify one or the other for not being the right color. 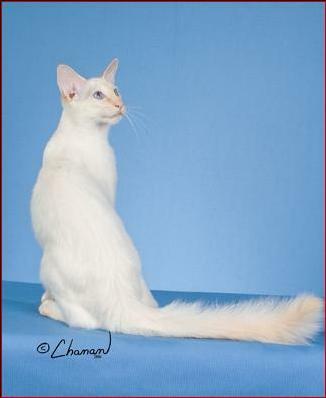 With the addition of Pointed Oriental longhair we now have a tri-fecta of genes to work with. If the Balinese breeders and the CFA Board can actually look past any B.S. we may someday merge them together and be a stronger gene pool for it. Pet buyers may ask what this might have to do with them; well, everything really, health for one. None of us want a cat that spends time and money at the vet because it is sick, do we? The bigger and more diverse the gene pool the better we all are. At Clowntown Cattery we work at keeping all inbreeding coefficients under 3%. We are also aware of lines that have problems and never double back on them, no matter how far away it may be. If a breeder cannot tell you the inbreeding coefficient, or refuses to, don’t buy their kitten. If they don’t know, they are not a professional. If it is over 7% run, don’t walk, as fast as you can; you do not want it! 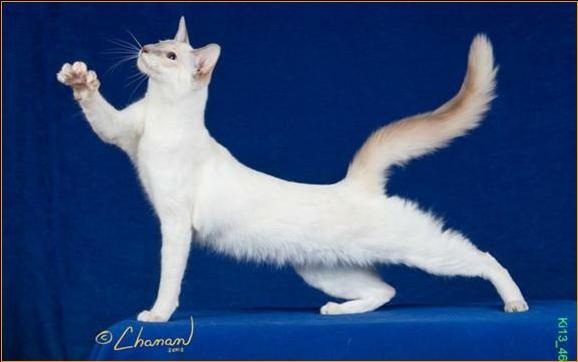 Kittens are available from time to time, but to ensure the cat’s health, and working towards a beautiful show cat, I outcross to shorthairs or variants (cats that carry longhair) This produces cats that are not allowed to be shown in CFA, but they will produce the next generation of longhaired Balinese and Javanese. This keeps the boning and refinement that the longhairs have trouble getting. So, I don't always have a longhaired pet for sale. 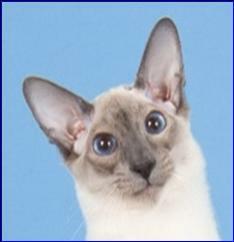 I do usually have shorthaired Javanese and Balinese kittens, which look and act just like their cousins the Siamese.